Scotland's most important artists of the past 25 years are being celebrated in GENERATION - a programe of exhibitions across the country in 2014. In a series of short films for BBC Arts, Kirsty Wark meets some of the creative minds who transformed the art scene in Scotland. Alison Watt’s early artwork centred on life drawing and representation of the human figure. But over the next few years the focus of her work shifted. 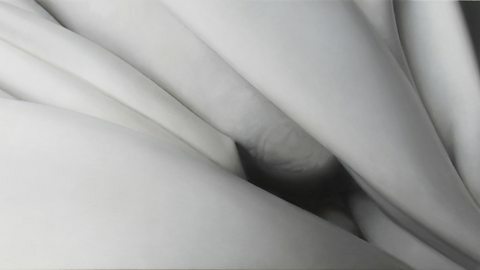 She began painting the folds and creases of fabric and draperies - evoking the human body. This was marked by Watt's Fold exhibition in Edinburgh in 1997. Her GENERATION exhibition at Perth Museum & Art Gallery traces her development as an artist. Born in Greenock, Scotland in 1965, Watt studied at Glasgow School of Art in the mid-1980s. She came to wider public attention in 1987 when she won the National Portrait Gallery's portrait award. From 2006 to 2008 Watt was Associate Artist at The National Gallery in London, culminating in her solo show Phantom. She was awarded an OBE the same year. She lives and works in Edinburgh. GENERATION is a showcase of some of the most important artists to come out of Scotland in the past 25 years. It brings together work by more than 100 artists to 60 galleries and exhibition spaces across the country. It charts Scotland's creative development during a period which saw the country earn an international reputation as a centre for contemporary art. It produced countless award-winning artists and exhibitions. The artists featured in GENERATION came to prominence while working in Scotland. They laid the foundations for the contemporary art scene that exists there today. The aim of GENERATION is also to help cultivate a future generation of artists, with a education programmes and events to inspire young people. The project is part of Culture 2014 - the Glasgow Commonwealth Games cultural programme. It is being held in partnership between the National Galleries of Scotland, Glasgow Life and Creative Scotland. From Ackroyd and Blake to Warhol and Watt. Explore our Art and Artists features.